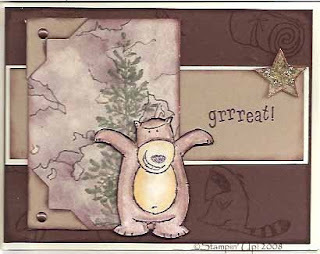 This card for the Technique Blitz uses a small piece of Camouflage from the October 2008 Technique Junkie Newsletter as a matting piece for my wickedly-cute bear. I just love this technique -- it is so easy, and fun, and has so many uses. Thank you again to Joyce Pacer for teaching it to me and the Junkies! Hey, you don't subscribe yet? There are 15 techniques in this 8-page (two extra pages! more than ever!) full color, glossy publication. They are delivered to your doorstep every-other month. Don't you just wanna learn how I did that paper? Email me for a PayPal invoice! 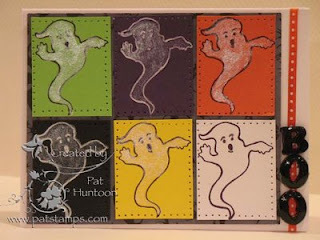 All Stamps in this sample are from Stampin' Up! 's Under the Stars set. 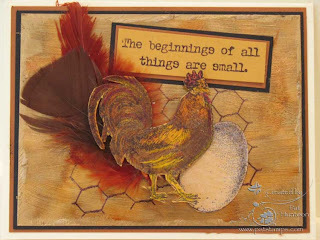 I am so happy with my submission for the Technostamper Sketch Challenge from Mary Jo Price-William's Blog this week. 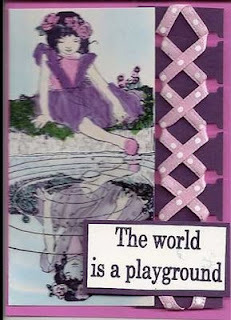 I used several techniques from the October 2008 issue of the Technique Junkie Newsletter for this card. The panel under the flowers uses the Rit Resist Technique and the panel beneath that uses the Cuttlebug Highlight Technique. 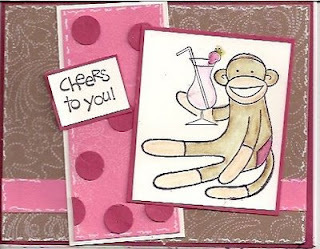 I love the way this card looks -- click on it for a close-up, if you would like to see detail. Back by popular demand...the Technique Blitz begins again. What that means is that I will try to post a technique-oriented card every day...or as frequently as my life allows. I will focus on the current issue of the TJ Newsletter or the CD bonus techniques most days, with a little straying here and there to show other things. Today's submission features an ATC that is quite different than yesterday's. The theme for this was was "Charming Children." A little sweeter than the disturbing one, no? 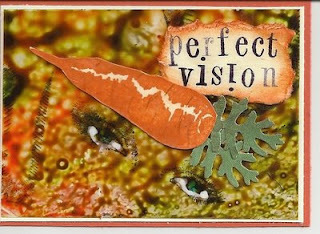 This ATC features the Ribbon Spiral Technique from the October 2008 issue of the Technique Junkie Newsletter. This technique is from TJ member and stamper extraordinaire Belinda Johnson. The stamps used for this ATC are from I Brake for Stamps from the Stampinback line. Aren't they sweet? The whole stamp plate is filled with wonderful images. I colored the stamp using Copic markers, regular marker, and colored pencils, and went over the blue-tinted water with Diamond Glaze (aka: Glossy Accents or Crystal Effects). Okay, now I am off to try to get some things done for the Blitz! Did you ever make something that was vaguely disturbing? The background on this is a Technique Junkie Newsletter technique called Acetate Swirl from the 6th Edition CD Bonus Techniques. The eyes were stamped on the Acetate, then colored with gel pens. Is it just me, or do they disturb you, too? I haven't had the opportunity to participate in the weekly Blogger's Challenge recently, so I am so happy to have a chance to play today! Today's challenge was to create a Warhol card, a technique done by the Technique Junkie Newsletter in the February 2005 issue. Such a simple technique -- it can be done with almost any stamp, too. 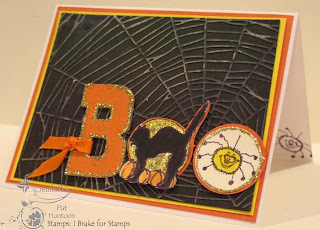 I chose to use a stamp from I Brake for Stamp's Halloween stamps. I happen to be giving this stamp set away this week, too -- click here to see the stamps and enter the giveaway. If you haven't entered to win it, you should! Today's card is a sneak preview from the newest issue of the Technique Junkie Newsletter coming out tomorrow! 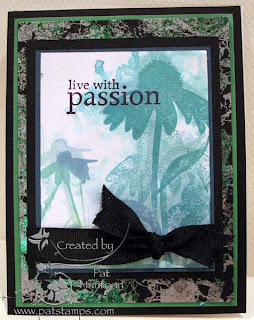 This card uses the Foiled Webbing Technique from the October 2008 issue as a background. I love how it looks with my Expressionistic Watercolor panel! These are new stamps from the newest catalog from Stampin' Up! These are my favorites from this catalog -- they are just so elegant. Boo! Today's stamps for the Wonderful Wednesday Giveaway are from one of our featured vendors for October's issue, I Brake for Stamps. I haven't stamped for several weeks -- I have had so many personal and professional issues and commitments, that it just was not in the "cards" for me. So, lucky for me, I had these fun stamps to work with for today's giveaway! I was so inspired by these stamps...these deeply etched, well-designed images are a joy to work with. The best part is that I Brake for Stamps have these stamps on special this week for 25% off -- in fact, there are a whole slew of stamps on special for 25% to 60% off. Really, these are just great deals! Okay, so how do you enter this giveaway? ANYONE can enter this give away.One entry per person, per give away, please. To enter the give away for today, simply leave a comment on this blog entry telling me that you would like to enter by 11:59pm EST on Sunday, September 28th. No other entry methods will be included in the give away. If you email me to enter, your entry will NOT be considered a valid entry. When you leave the comment, make sure to put your NAME in the comment -- if you enter your comment as "Anonymous", I cannot give you the prize! Blogger does NOT record your email address for me, so you will need to check back to find out if you have won or include your email address in your comment so that I can notify you. A good way to do this is like so: phuntoon at optonline dot net -- it will help protect your privacy! I will have a random number generator pick one number from the comments to select one winner. Each give-away is separate, so to be eligible for a specific item you must enter that day's contest on the post where it is listed. Enter today -- good luck! I have blog give aways every Wednesday -- come play! The Winner of this stamp set is vlromaine! Congratulations! 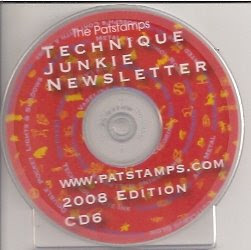 This week's wonderful Wednesday giveaway is simple -- the winner will receive the Technique Junkie Newsletter 6th edition CD (if you have already ordered or received the CD, you will receive a refund, or you can select a different CD). In addition, the winner of this Giveaway will receive a sneak preview! You will receive 5 cards made by me with Techniques from the soon-to-be-released October 2008 Technique Junkie Newsletter issue AND the link/password to the October 2008 online tutorials -- a full week ahead of everyone else! 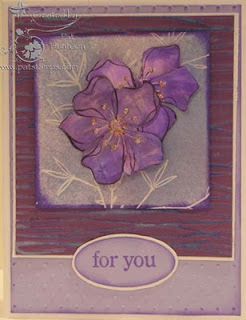 Remember, there is a free tutorial from the CD HERE: Waxy Cuttlebug Tutorial. Okay, so how do you enter this giveaway? ANYONE can enter this give away.One entry per person, per give away, please. To enter the give away for today, simply leave a comment on this blog entry telling me that you would like to enter by 11:59pm EST on Sunday, September 21st. No other entry methods will be included in the give away. If you email me to enter, your entry will NOT be considered a valid entry. When you leave the comment, make sure to put your NAME in the comment -- if you enter your comment as "Anonymous", I cannot give you the prize! Blogger does NOT record your email address for me, so you will need to check back to find out if you have won or include your email address in your comment so that I can notify you. A good way to do this is like so: phuntoon at optonline dot net -- it will help protect your privacy! I will have a random number generator pick one number from the comments to select one winner. Each give-away is separate, so to be eligible for a specific item you must enter that day's contest on the post where it is listed. Enter today -- good luck! I have blog give aways every Wednesday -- come play! The winner of this giveaway is Mary Ann Evan! Congratulations!!! CD 6 and a Free Sample Tutorial! Eighty three tutorials -- all in the same format. Eighty Three. The CDs are $14,95 for subscribers or $19.95 for non-subscribers (US Addresses). Renewal or one year subscription and the CD is only $29.95 through October 1st. What are you waiting for? Email me today for your copy and/or renewal. I will be posting again later, but I felt the need to post this now. I don't usually like to start things with an apology, but sometimes you have to... Some things just take hold of you an never let go. I had to get this one "out of my system." If you liked Cruel Cats (the story of Princess), then you will certainly like this one: Sokz in the City (rated PG). Enter my sense of humor at your own risk! 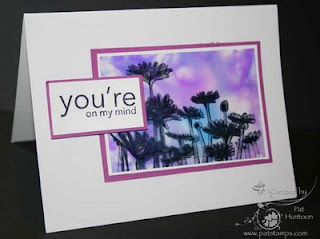 Today's Wonderful Wednesday giveaway offers one of my favorite stamp sheets to work with. 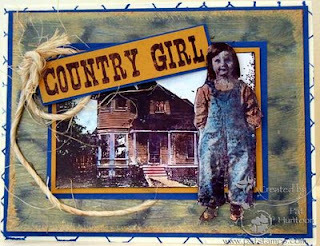 These Country Girl stamps from Oxford Impressions are great whether you are creating a collages or using individual images, as I did with these two pieces. These two cards were made using the Metallic Stone Background -- one of the ten Bonus Techniques from the new Technique Junkies 6th Edition CD. If you are a regular on my blog, you know that normally I only have one card to give away with the stamps...today is a bit different. The second card will be given away to one of the people who order this week from Oxford Impressions. 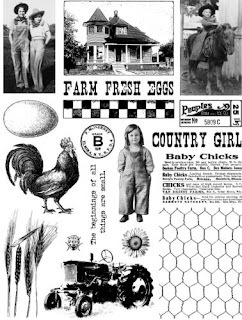 To make it easy for you, you can take 20% off all unmounted stamp plates and collage sheets through Sept. 10th. Simply use the discount coupon code: pat20good to receive your discount. 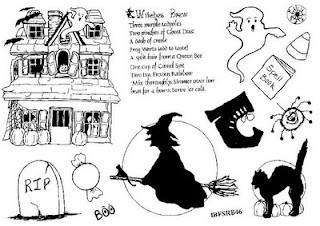 Suzanne will also send a free Halloween inchie circle collage sheet - a $4.00 value - to anyone who uses the discount code. After September 10th, the card will be mailed to one of the people who orders Oxford Impressions (drawn randomly). Did you know that Oxford Impressions was just featured by Stampington's Take Ten Magazine? How awesome is that? Okay, so how do you enter this giveaway? ANYONE can enter this give away.One entry per person, per give away, please. To enter the give away for today, simply leave a comment on this blog entry telling me that you would like to enter by 11:59pm EST on Sunday, September 7th. No other entry methods will be included in the give away. If you email me to enter, your entry will NOT be considered a valid entry. When you leave the comment, make sure to put your NAME in the comment -- if you enter your comment as "Anonymous", I cannot give you the prize! Blogger does NOT record your email address for me, so you will need to check back to find out if you have won or include your email address in your comment so that I can notify you. A good way to do this is like so: phuntoon at optonline dot net -- it will help protect your privacy! I will have a random number generator pick one number from the comments to select one winner. Each give-away is separate, so to be eligible for a specific item you must enter that day's contest on the post where it is listed. Enter today -- good luck! I have blog give aways every Wednesday -- come play! The winner of this giveawy is Barb Oliver! Ahhhh. Acetate swirl. Just divine with silhouette-style stamps (and more). What, you say? You are not familiar with this technique? Well, it is one of the 10 bonus techniques on the newest Technique Junkie Newsletter 6th Edition CD. Don't ya' love sneak previews? P.S. You can order your copy of the CD today, too! Email me for details. Today's Technique Blitz card is a sample of Mini Kissing, on of the 10 Bonus Techniques from the soon-to-be-released 6th Edition CD from the Technique Junkie Newsletter. 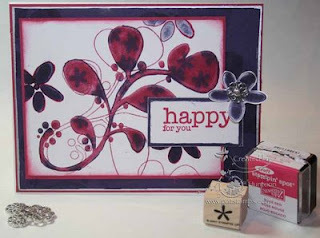 The stamps used here are from Stampin' Up!. Hope your Labor Day weekend is wonderful!